The Dell Inspiron 660S Desktop is powered by Intel Core i3-3240 processor with 3M cache, 3.4 GHz. It's 3rd generation. The desktop run on Windows 8 64 bit operating system. There are 4 GB DDR3 SDRAM and 1000 GB SATA hard drive. Other specs such as DVD+/-RW optical drive, Intel HD integrated graphics, integrated 5.1 high definition audio and Dell DW1506 wireless. For owner of this desktop, you can read the Dell Inspiron 660S Desktop User Guide in pdf format. In the manual you can get information about troubleshooting problem. The Dell Inspiron 660S Desktop user manual available in english language. It's consisting of 4.98 MB. Some important informtion such as safety, system board compnents, removing and replacing computer cover, fan shroud, memory, PCI-Ezpress cards, drive cage, removing and replcing hard drive, power supply, processor, cell bvttery, flshing the bios, and system setup like clearing forgotten passwords and CMOS. Remove the computer cover. See "Removing the Computer Cover" on page 17. Remove fan shroud. See "Removing the Fan Shroud" on page 19. Locate the3-pin password reset jumper (PSWDCLR1) on the system board. See "System Board Components" on page 15. Turn on the computer to clear the password. Turn off the computer and disconnect your computer and all attached devices from their electrical outlets. Remove the 2-pin jumper plug from pins 1 and 2 and replace it on pins 2 and 3 to enable the password feature. Replace the fan shroud. See "Replacing the Fan Shroud" on page 20. Replace the computer cover. See "Replacing the Computer Cover" on page 18. Connect your computer and devices to electrical outlets and turn them on. WARNING: Before working inside your computer, read the safety information that shipped with your computer and follow the steps in "Before You Begin" on page 9. For additional safety best practices information, see the Regulatory Compliance Homepage at dell.com/regulatory_compliance. WARNING: The computer must be disconnected from the electrical outlet to clear the CMOS setting. Remove the front bezel. See "Removing the Front Bezel" on page 33. Remove the drive cage. See "Removing the Drive Cage" on page 37. Locate the 3-pin CMOS reset jumper (CMOS1) on the system board. 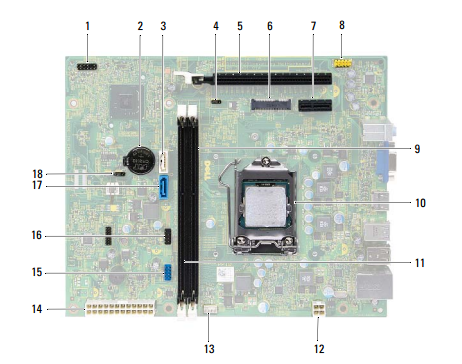 See "System Board Components" on page 15. Remove the 2-pin jumper plug from pins 2 and 3 and fix it on pins 1 and 2. Wait for approximately five seconds to clear the CMOS setting. 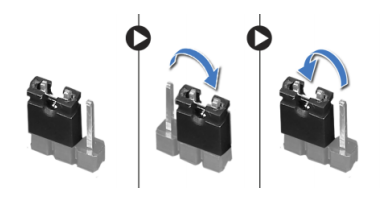 Remove the 2-pin jumper plug from pins 1 and 2 and replace it on pins 2 and 3. Replace the drive cage. See "Replacing the Drive Cage" on page 39. Replace the front bezel. See "Replacing the Front Bezel" on page 35. Follow the instructions in "After Working Inside Your Computer" on page 11.